Talk about a perfect fall meal! This stuffed acorn squash was so yummy! And really wasn’t all that difficult. 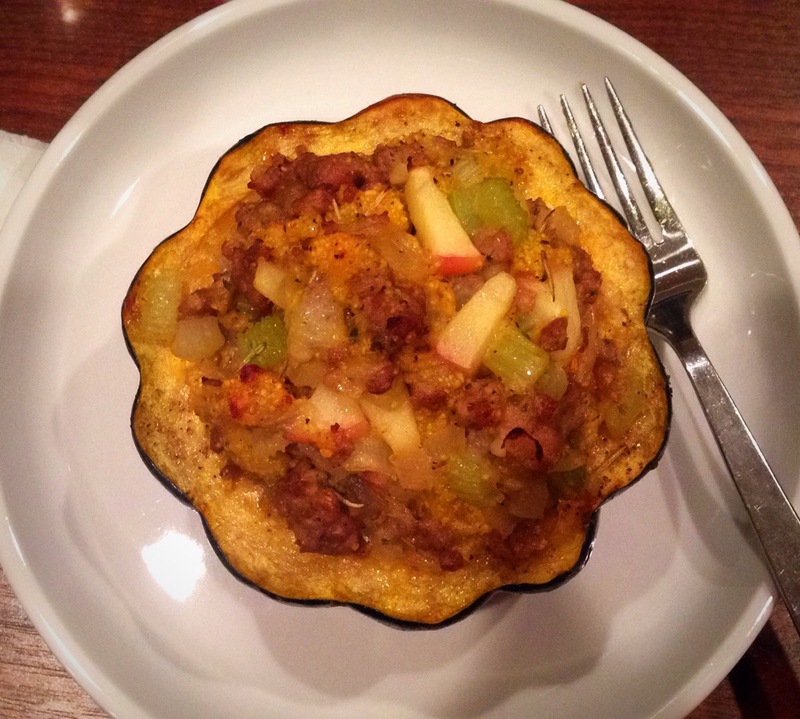 The sweetness of the squash and apples pairs beautifully with savory flavor of the sausage, onions, and celery. The kids weren’t in love with it, but that’s fine! More for me and the hubs! I got this recipe from a Tasty video I saw on Facebook (check it out here). There was no formal recipe and I had to watch and pause the video a millions times to get all the ingredients correct- kind of a pain. So, I’ll make it easier for you by writing them out. Plus I adjusted the ingredients to make 6 servings instead of 2. You’re welcome. Preheat oven to 400 degrees. Wash your acorn squash and cut both top and bottom off of the squash and then cut them in half (here’s where the video comes in handy). Dig out the seeds and guts. Line a baking sheet with foil and place your squash halves on it with the dug out part up (like a bowl). Drizzle the squash halves with olive oil and sprinkle with salt and pepper. Put those guys in the oven and bake for 40 minutes. In the meantime, make your stuffing. Heat 1 Tbsp olive oil in a large skillet over medium-high heat. Add your onion, celery, salt, pepper, and rosemary. Let cook till the onion starts to get slightly soft and then add your garlic and continue to cook for another few minutes. Now add your diced apple. Once apple is slightly soft stir in the breadcrumbs and parmesan cheese. Remove from heat and set the stuffing aside until your squash halves are done baking. Once squash has baked for 40 minutes, remove from the oven and start stuffing them. You’ll have lots of stuffing so really heap it up and press it in to your squash. Put the stuffed squash back in the oven and bake for 20 minutes. Hope you enjoy this fabulous taste of fall!